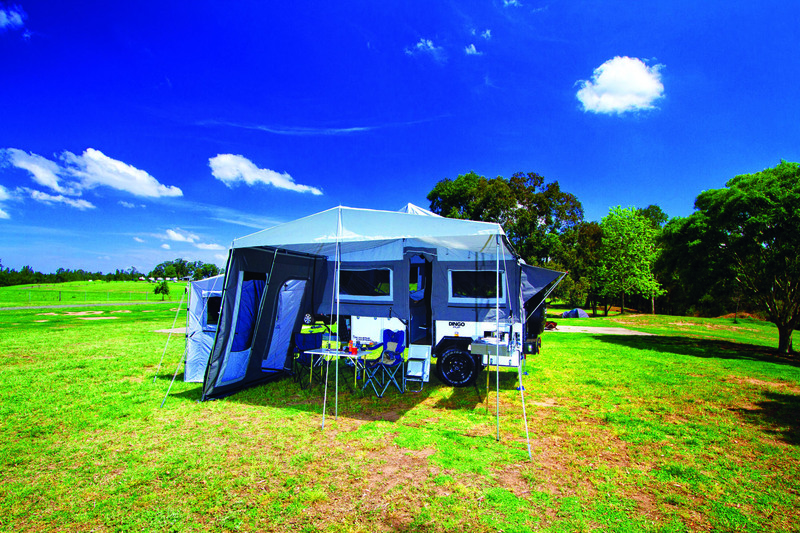 In a world where your wallet is emptying from rising fuel prices and your ears are ringing with messages about minimising your environmental footprint, you might be tempted to rule out switching to a ‘big’ four-wheel drive before buying a camper trailer, even if the switch is within your budget. But then, how can you satisfy your desire to see Australia from the comfort of a camper, while driving a smaller vehicle, perhaps even a two-wheel drive? Well, Skamper Kampers say they have the solution for you, with the release of their Dingo Pup model. 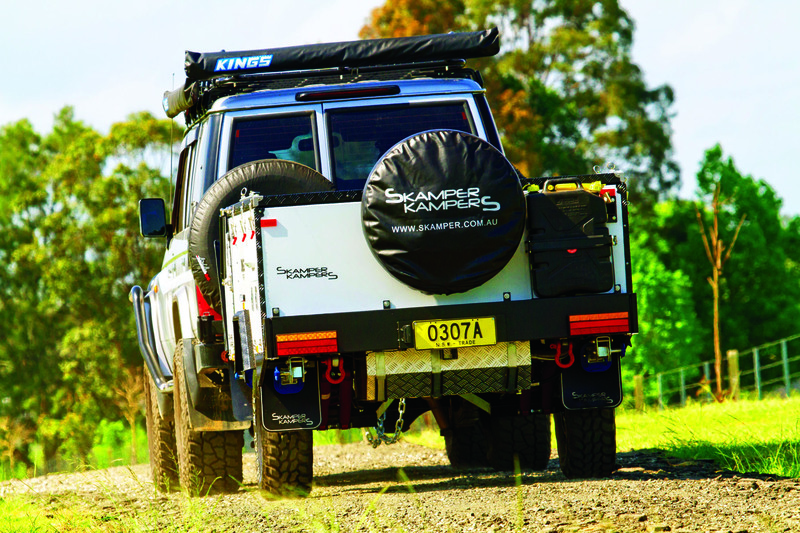 Following in the wheel tracks of the highly successful Dingo, the Dingo Pup slots into the Skamper Kampers’ forward fold range as a scaled down version of its forerunner, both in terms of price and size. In physical dimensions, the Pup is essentially an 80 per cent version of the Dingo. In making that reduction in size and weight, the Pup misses out on certain features or has them in modified form, as you would expect. This extends in terms of price, with the Dingo’s $19,000 NSW price tag dropping to $16,000 plus on-road costs with the Pup. That’s a reduction of 16 per cent. This translates to a diminished kitchen setup and smaller box fridge, as well as a reduction in most other dimensions. It also translates into a simplified electrical setup. We’ll get to those things as we go, but fortunately, due to the brand’s close attention to detail, the Pup suffers no loss of quality across the board. Indeed, this camper reflects the approach of lifting the quality of imported campers to match the local product. 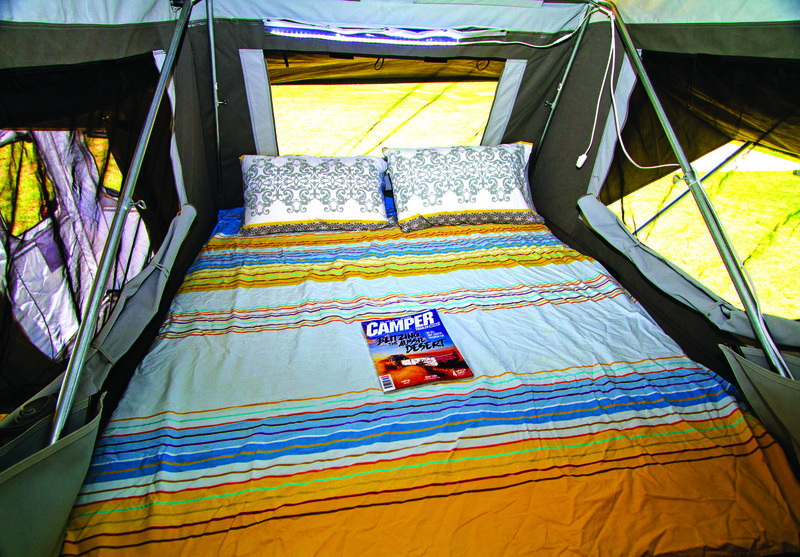 Skamper Kampers have made tremendous headway in this direction. Chatting to workers at their Emu Plains headquarters in NSW while we were waiting to pick up our review camper, we got the impression this is a business that’s going gangbusters, with staff working a lot of overtime in their ongoing attempt to keep up with orders. The once roomy factory and warehouse was crowded with campers. The Pup, like all the brand’s models, is built on a hot dip galvanised one-piece chassis, with a sturdy-looking trailing arm dual shock independent suspension. The 10 inch electric brakes have a LandCruiser six-stud pattern with 15 inch mud terrain tyres on black steel wheels. The ground clearance is reasonable. It does have a short drawbar that would not suit tow vehicles with boots that open out like barn doors. If you needed anything large from the back of the car you’d definitely need to unhitch at camp, though removing the winch would give you a little room. The light ball weight when empty means anyone with a strong back can literally lift the camper on and off the hitch. That hitch is an excellent 2000kg McHitch, but the 500 series Ark jockey wheel seemed to struggle with the job, if the amount of flex it displayed was any indication. The front stoneguard is a checkerplate aluminium structure with black powder-coat finish that lacks the hinged ends Skamper Kampers introduced last year for their larger models. The reasoning for this exclusion is weight, but it does mean that if you run out of gas while camping you have to lift the front bed extension to access another bottle. Behind the stoneguard there’s two 4kg gas rings and two jerry can holders; there’s also a jerry can holder on top of the pole carrier at the rear, although this space is cramped due to the winch mount above. The front fridge box has a carpeted 470 x 990mm slide which will cater for up to a 60L fridge. It has both Anderson and cigarette plug outlets to suit customers of either preference, as well as an exhaust fan and automatic internal light. The best part, though, is that the box is insulated to minimise the heat burden on the fridge and make it more efficient. Every camper manufacturer should be doing this. To complete that picture all they need to do is extend the insulation to the inside of the door. 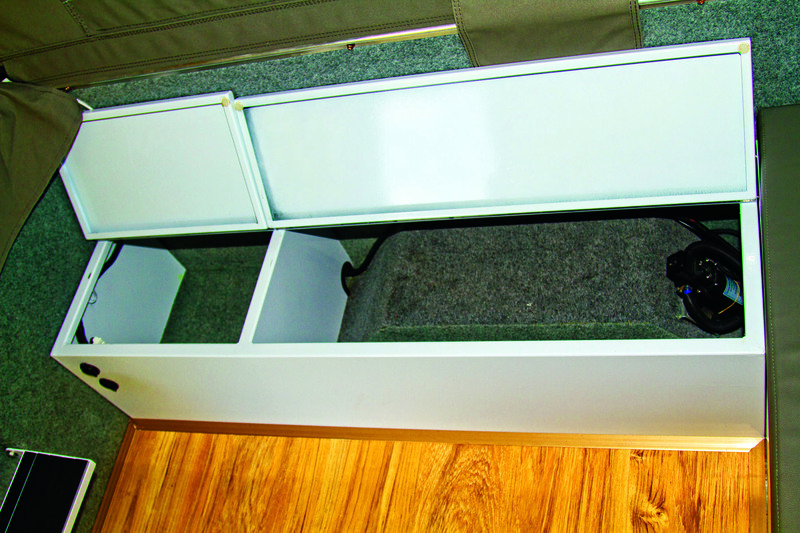 The driver’s side of the fridge box is a carpeted storage area that can carry canvas, a generator or other gear. Immediately behind the fridge is a camper-wide locker that has a 1170 x 290 x 190mm deep pantry drawer, big enough to store your food and utensils. However, the tapered space at the top is somewhat wasted and would be improved by a shelf that makes it a functional storage area for other items. The back side of the drawer is a 300 x 360mm storage area that might well carry a small porta-potti or hot water system. 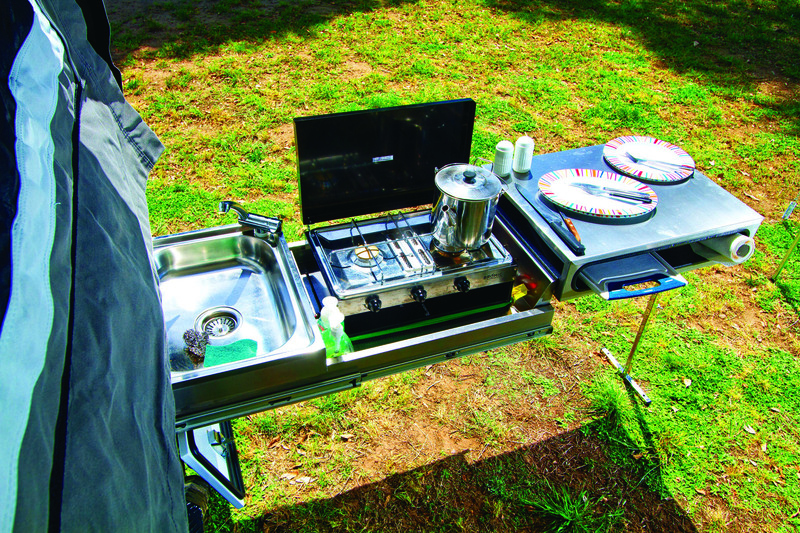 The slide-out kitchen has been greatly simplified, with a square sink somewhat awkwardly located against the body of the camper and a stainless steel box on the other side of that. This box folds over to create a benchtop and reveal a two-burner camp cooker next to the sink. Given the cooker is only held down with an occy strap, you can shift it to the outer extension, with the benchtop shifting to next to the sink. Above the kitchen on the wall of the camper is an LED bar light. To use the kitchen in standard trim one of the gas bottles must be carried back to plumb the cooker (remember to do this before opening out the tent). However, there is an optional permanently plumbed setup. Water must also be connected when setting up and a leg inserted beneath the kitchen end. Water is carried in a 120L stainless steel tank, with a 4L per minute pump that pressurises both the kitchen tap and a drawbar outlet. This latter outlet can be connected to a shower hose in the ensuite, which attaches with velcro to the awning’s front wall. The electronics are controlled by a panel at the rear on the driver’s side, which has resettable fuses and switches for five circuits, a main 50amp fuse and switch, plus volt and amp meters. Power is stored in a 100Ah lead crystal battery. There is room for a second but no option from Skamper Kampers for one to be fitted at the factory. You also get a 10A CTEK mains charger that can either be bolted in, or left loose and simply attached to the battery with the supplied bulldog clips. This second option allows you to use the charger on other batteries, such as in your car, but is a little less convenient in terms of having to run a lead into the camper. Skamper Kampers’ attention to detail is evident in the use of 6B&S cable to wire up the drawbar Anderson plug so that you get the best possible voltage back from your car’s alternator. A DC-DC charger would really complete that setup. There are two 12V cigarette plugs plus a dual USB outlet inside. The access steps are narrow, enforced by the smaller body size and smaller width port (380mm wide) in the side; entry and exit should be made with care. The internal space isn’t bad, considering this is a small camper, but, as with so many forward folds, the space beneath the seats is very limited. All the finish, aside from the foam cushions and the laminate flooring, is metal, which is durable. The interior table is removable and can be taken outside. It has individually adjustable legs to suit uneven ground. It has to travel folded down, bridging between the two seats, with the cushions on top. Notionally you can carry items beneath; however, the tendency of the table legs to fall down into that space makes access awkward, so you wouldn’t be fitting much under there. The side wall, as with all forward folds that we’ve seen, can be rolled up for that enviable access to the outside. The 70mm foam mattress is a double size, with an LED light strip above the head to match the strip above the rear end of the tent. A privacy screen allows you to seclude the main bed. A double bed can be made up at the rear of the interior, from the table and a supplied filler piece covered by seat cushions. There are two smallish handy canvas pockets near the foot of the bed and two in the lounge area, though the use of the latter would be limited as they fall behind the side cushions. The tent is all 15oz plain weave canvas and erects with pleasant ease. 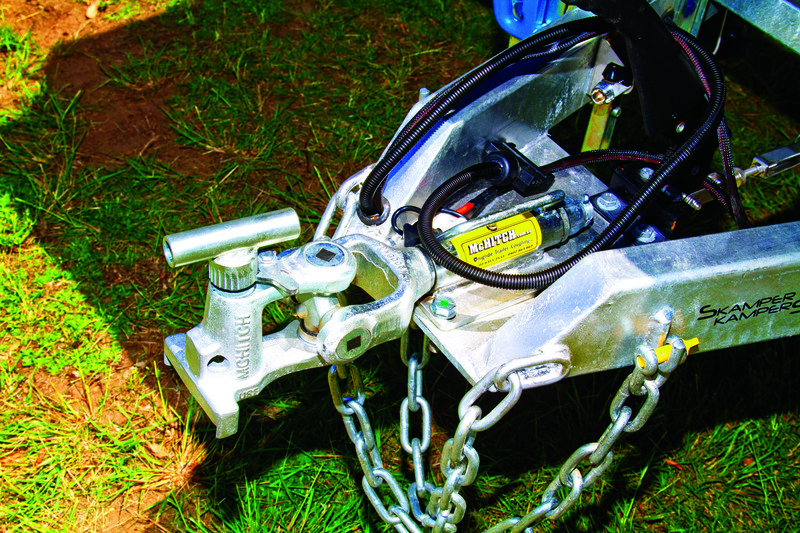 There is a winch at the front, which can be removed and swapped to the rear if needed, but opening and closing the camper by hand should be well within the reach of most healthy individuals. The gas strut assisted rear hoop goes straight up and then it’s just a matter of adjusting the length of the internal hoops and adding two vertical poles under the front hoop (if there’s any chance of wind). 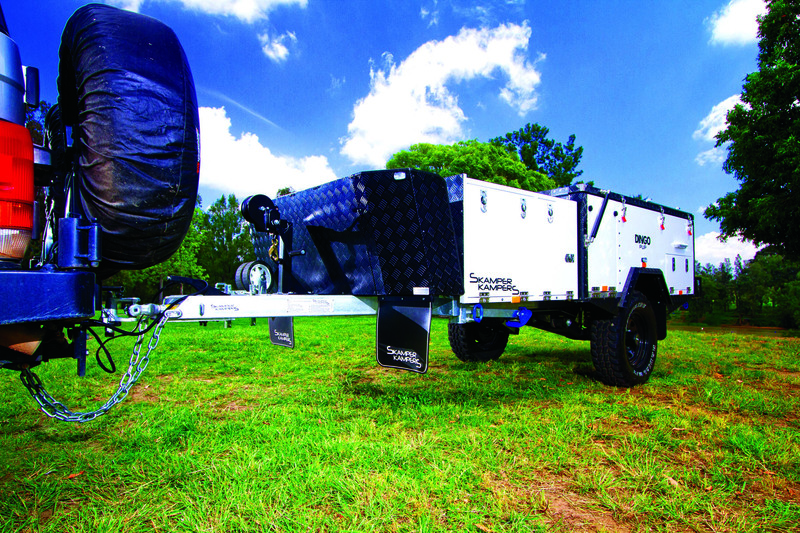 If rain is likely or heavy, there are three longitudinal spreader bars for the tent interior to assist in drainage. The canvas around the entry door simply attaches with press studs. The tropical roof automatically erects and remains attached. 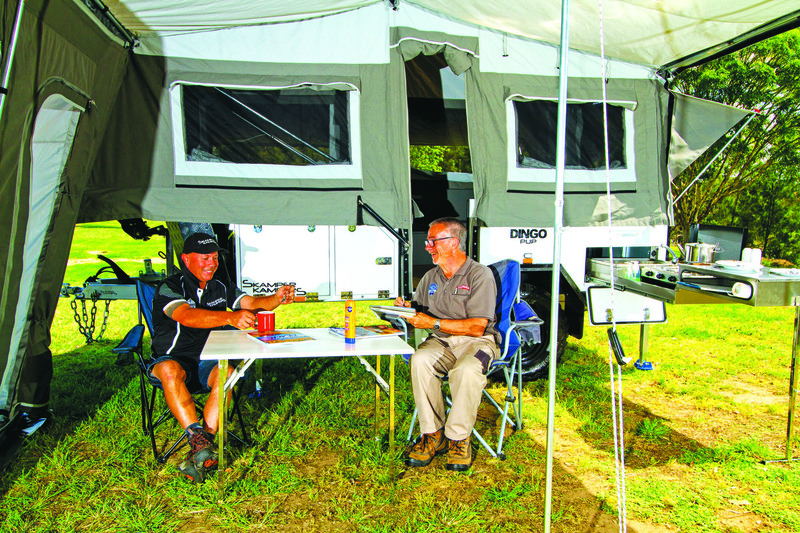 There are five windows in the tent, all with internal and external covers, and the outside of the front, side and rear windows all have external awnings. All the poles travel in a rectangular pole box across the back, which is accessible from both sides and which assists in lowering ball weight via counterbalancing. Fully erected, with the window awnings out and ensuite set up, there are 19 poles and spreader bars, plus up to five spreaders internally in the tent. The main awning, as we saw it, required five spreader bars and four vertical poles. Again, Skamper Kampers’ attention to detail was a big plus. The main centre pole of this awning is equipped with a RAAWcon attachment, which hinges the spreaders on either side, so they stay attached, and once that centre pole is up you can erect the front walls single-handed. This RAAWcon gizmo is worth its weight in gold and it beats me why it wasn’t invented twenty years ago. The spreader bars extending out off the camper tent attach via stainless steel carabiners; this gives a positive connection to the inside of the tent that even strong winds can’t separate. The underside of the awning roof has heavy-duty PVC liners sewn over each spreaders’ area of contact, so wear is never a problem. There are a number of velcro tabs to attach the awning to the spreaders, so you don’t get that billowing lift in heavy winds. All good features. The front wall of the awning needs to be attached if you want the 1200 x 1200mm nylon ensuite. This is because the front wall occupies the inner half of the ensuite’s wall. The ensuite has a zip-open port for the shower rose and three screened windows. There’s a rear wall to shelter the kitchen, an outer wall, draught skirt and a heavy-duty PVC floor which connects with velcro to completely enclose the living area in the event of any really nasty weather. 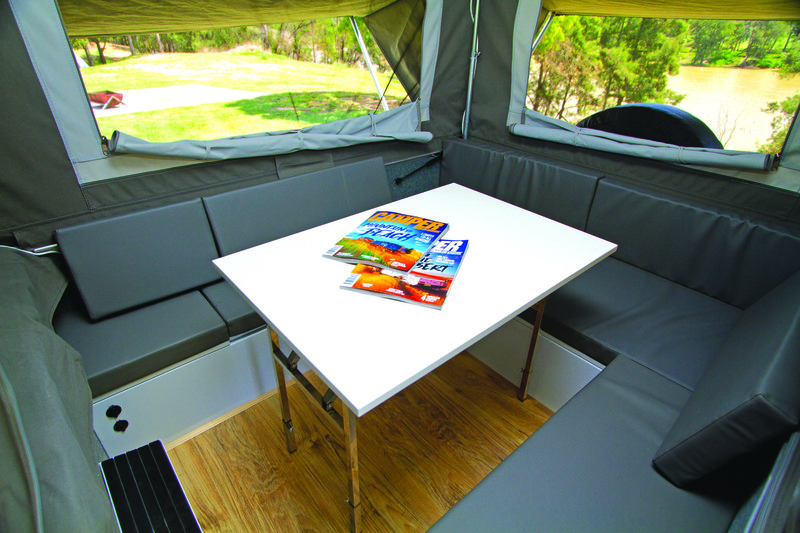 The camper comes with tie-down racks with four moveable eye-bolts and a roomy rooftop carry bag that can be strapped down to these racks. This bag has to be unloaded before setting up camp and lifted back up on pack-up, but it does extend the carrying capacity of the camper. The Pup’s load capacity of 440kg (keeping in mind the 120kg of water it can carry, plus what weight may be in jerry cans and gas bottles) might be a bit limiting, as might its storage capacity. All in all this might necessitate carrying some of the load in the vehicle. Other options include a 2000 x 2000mm kids’ room, which extends off the rear awning wall, and a ‘travel awning’ which is slightly narrower and erects simply with three poles along the front and no spreader bars. 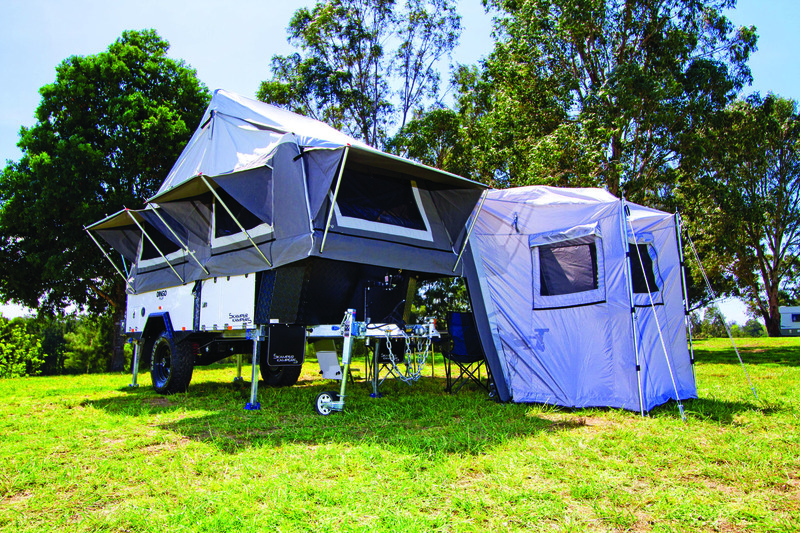 The Skamper Kampers Dingo Pup could be the answer for those who want to go camping but don’t wish to invest in a heavy-duty 4WD. It would be well within the tow capacity of just about any vehicle on the market. Plus, it’s strongly built, with an excellent suspension and a lot of attention to detail, so it should bless users with a long life. At $16,000 plus on-roads, the Dingo Pup is well-priced for what it includes. The five year chassis and structural warranty is excellent, though I would like to see a few more options, such as a second battery and a DC-DC charger, even if these were to add to the price. Such small-scale changes would truly cement the Dingo Pup as a practical camper that can not only go just about anywhere, but can stay there for a long time too.